In simple English, email marketing aims at attracting new clients, promoting your business, making people remember you and come back again and again. There are multiple techniques, tools, hints, and strategies on how to reach that goal. To understand, what you need and where to find it, here are some stages you have to consider one by one in detail. Wow, that’s a bright idea, you probably say sarcastically right now. Of course, you need people’s addresses to send emails to them. The point is how to get some. And that is where the marketing thing starts. There are several ways to gather email addresses from your clients (or future clients). You can add a sign-up form on your website, or social media profile, or advertising banner. You can also collect emails in person – by asking your clients to share with you. But the best way is to offer something a bit valuable for the people’s email address. It can be a discount, getting to the priority list, receiving the best offers, getting product samples, etc. This way you will quickly increase your email list and get some potential clients right away. And therefore, a person just deletes them without reading. Many commercial, promotional, advertising emails get to the spam section. To avoid this, you have to get acquainted with several rules. First of all, browse through the CAN-SPAM Act – a law that sets the rules for the commercial emails. Next, consider the following things that will encourage people to open your letters and never mark them as spam. Give people an easy possibility to unsubscribe or refuse to receive emails from you. This is not only the matter of respect but the necessary rule from the CAN-SPAM Act. It is better to be personal when you send your letters: people are more likely to open the email from Garrett Peterson, Legal Solutions Ltd., than just from Legal Solutions Ltd.
Make your Subject line sound engaging and interesting. Some intrigue will make a person open an email and check what’s in it. By the way, if you promise something in the Subject line, deliver it in your email! Send your emails at a time, when people are most likely to open them – at the beginning of the workday. First thing here is the relevance of your content: does it meet the needs of your target audience? Does it deliver what is promised in a subject line? Does it valuable enough to browse through, share, and save or remember? Next, think about content management. Your email should be easy to read. So use headlines, bullet points, short paragraphs. Forget about large plain text and wordy headlines; no one would bother getting through them. The good idea is to add some relevant images (but don’t overuse them, this would create a mess). And the last but not the least: use an email signature. Sometimes people open an email, look at the signature, and only then come back to reading. So your email signature should be good-looking and professional. Some marketing tools help you to check whether your emails are opened, or marked as spam, or deleted, does a person click on banners and links in it, how many people follow to your website after reading your email, etc. Most of these features can be received through the Google Analytics. By tracking the results, you can make your email marketing more effective: you will see, what time is the best for sending emails, how people react to different subject lines, what images or banners your clients like the most, is your call to action powerful enough to reach the goal. 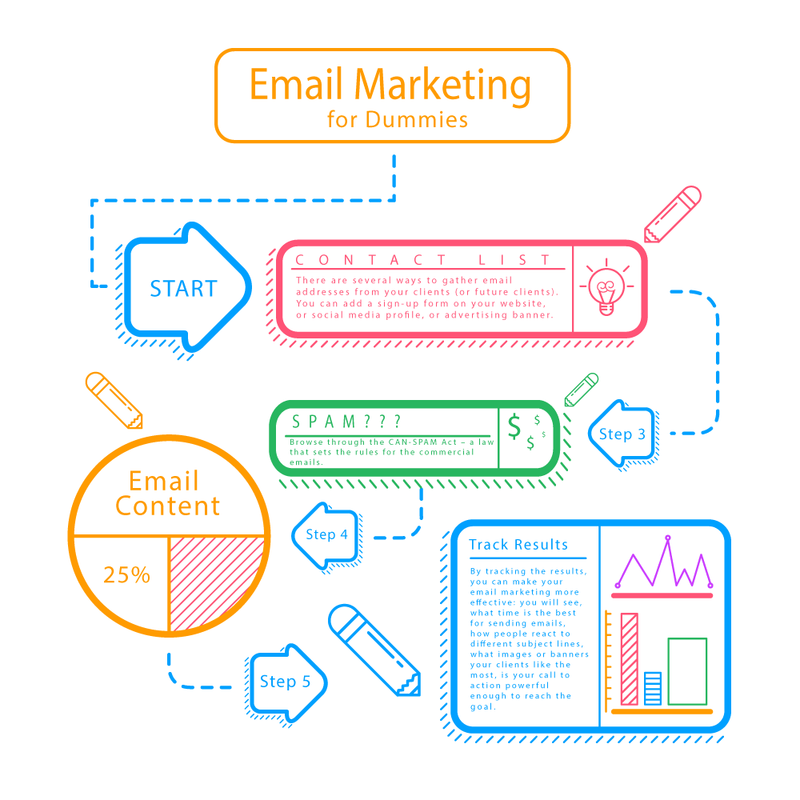 Many stages of email marketing campaign can be automated and optimized. Yes, some things are better to be done manually. But when you have hundreds of email addresses in your list, it’s impossible – you won’t have time for your business itself. Some services provide various templates for your email content – newsletters, offers, welcome emails, reports, etc. They often have some built-in features like click tracking, integration with Google, “share” buttons, etc. Tools like Mail Chimp, Reach Mail and similar provide you with a possibility to create several email templates, like Welcome, Reminder, Thank you emails, segment your list of addresses, send emails in particular time and to certain people, add auto-responders, gather statistics, etc. Email signature generators, as MySignature, make the creation of email signature fast and easy. You only have to enter your contact info, links to your social media profiles and websites, choose image – and the signature is ready. Email signature makers use professionally designed templates, create HTML signatures that work flawlessly on any mobile devices, provide the possibility to add links, banners, and trackers. So, these were five points you have to examine in detail before launching an email marketing campaign. There is much more to learn, but now you know where to start and what to search next. Still, whatever you do, remember the rule, appropriate for any business: find out what people need, offer it, and you’ll find success. Next PostNext How Does a Top Digital Marketing Agency Build Email Campaign?